For most of us, the notion of home is a central plank in the very construct that is our identity. It forms our earliest reference points in our existential constitution. It shapes and models where and what it is for us to be in our world set within a wider universe of culture, matter and other humans. And whilst arguably it should not define or limit us internally, what we believe we can do, or externally,where we are placed by others, it inevitably shapes us. If only as a departure point for our various journeys through life. Home isn’t just bricks and mortar or possessions either. Home is about people, about a feeling. It is about belonging, or not belonging. Home is complex and multi layered. Home is rarely straight forward. It is not surprising that many artists are drawn into exploring the notion of home creatively. But as a core area of artistic enquiry it holds a plenitude of potential pitfalls. Some enter the territory of personal identity. This spawns work from the ‘me’ perspective rather than the ‘us’ and much can get lost in subjective self-indulgence. Of course everyone’s lives are important to them but that does not necessarily translate into being interesting art for others. And I firmly assert good art speaks to others. Some explore home as stuff or belongings, placing value on personally significant objects, which can fail to translate to the wider world. It seems to me, the most complex and intriguing aspect of ‘home’ is the idea of home as an emotional site. Here you need an artist who understands and negotiates the territory between a formally recognised motif or form and the emotive potential and connotations of material language. And this is where, as an artist Carol Harries-Wood steps up to the plate. For she is intuitively wired to playfully activate the semantic space between visual forms, materials and the viewer. Central to this work is the reiteration of a small basic house form time and time again. And I mean basic, two walls, two gable ends and a pitched roof. No detail, Just a crude house form, recognisable from the earliest of childhood drawings. Just enough to say house, in a clear unequivocal sense. Devoid of any further details; windows, doors, chimney stacks, conservatories or porches Neither Coronation Street terrace, nor affluent Georgian town house. Neither semi nor detached. Neither up North or down South. An essence neatly distilled. This elimination of further formal coding is critical in paring down the baggage that could otherwise derail the viewer into other tangential realms. It is a clarion call to focus on home, not architecture. Home, not property. Home, not post code. This economy of information combined with the almost hand held scale of the forms artfully placed through the space creates a focussed and intimate viewer interaction. Once she has orchestrated our attention, Harries-Wood brings into play her succinct awareness of material sensibilities. Having viewed much of this work in the flesh, it becomes evident that she is an intelligent artist who considers and deploys divergent coded media to generate layers and levels of reading within a repeated motif. As one moves through the work in the show, the form is reiterated but changes with each step through a potent range of materials. Each carefully chosen, sparking up a different set of associations for the viewer. 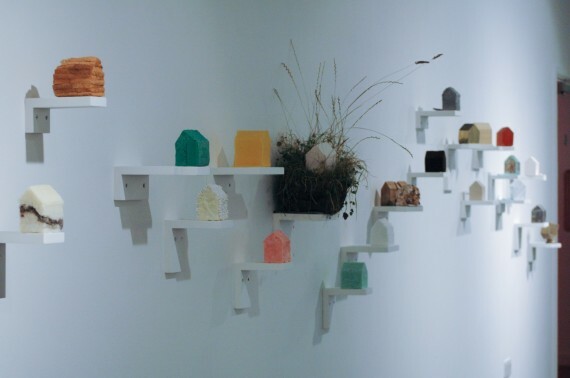 Coloured scented block soap forms take us inside the notion of home, the more floral entering the world of personal cleansing, others connecting us to a world of carbolic scrubbing and harsh utilitarian housework. Both are ephemeral and easily washed away and remind us of our temporal occupation of both our homes and the globe. In another, stone suggests a colder harder place, impossible to penetrate, yet enduring in quality. In another, grey concrete alludes to the grim inner city world which Jersey as an island neatly avoids. A stacked bread-house form connects us to home and sustenance and home as a site for survival and sanctuary. A glass house evokes our fragility and sparks a Pavlovian recital of a well-known proverb in the head. Another house is made of block salt, a commodity historically used for preserving and as currency in Roman times. Passing from form to form one navigates a shifting landscape of material and sensory stimuli. Ideas of memory and impermanence, security and insecurity all resonate through the body of work. Whilst play permeates the exhibition, it is a reflective play, rather than play for plays sake. There is a strong sense of the impossible, gently shedding light on our futile attempts to drop anchor and find lasting sanctuary in an ever shifting, intrusive and topsy-turvy world. Accepting the question mark over an absolute universality of meanings, Carol Harries-Wood is wholly conversant in sculpture as a choreography of material language, physical form, sensory stimulation and context within the frame of the contemporary art world as we know it. Building on her success of her previous solo show at the Civic in Barnsley, Harries-Wood has developed additional work in reaction to a research visit to Jersey. These will be dispersed around various sites across the island. Compared to her earlier works, these introduce more specific references that probe, reveal and celebrate aspects of Jersey’s personal historical legacy and wider gift to the United Kingdom in agricultural produce. An inverted house form carries a red cross and sits below a carpet of artificial grass. This work refers to the underground hospital built under the German occupation of WW2. Built by forced labour it stands as a perverse legacy to both engineering and industrial scale cruelty. The tax haven status of Jersey, is playfully touched on by a house containing a Jersey pound note. Emblazoned with the Queen’s face, it reminds us of the curious connections and disconnections of the Island with the UK. A hessian sack-house form, carries the printed text ‘royals’ the grandest of titles ascribed to the beloved new potato crop. Another form is made from a Jersey milk Carton. This desire to make art inspired from the ordinary is a continuum throughout much of Harries-Wood’s work. From a sculptural perspective, one can draw parallels with other’s work and Harries-Wood clearly acknowledges the lessons learned from the Italian Arte Povera movement, with its celebration of non-hierarchical media and form. Her work also nods towards key 20th century artists such as Louise Bourgeois and Richard Wentworth, both exponents of visual poetry. However, the key for all good artists is to take inspiration, but to make their own mark. In this show Carol Harries-Wood emphatically steps beyond influence to sing with her own voice. This voice resists the large scale grandstand viewer experience, showing a preference for audience intimacy. She does this with integrity, conviction and a heartfelt sensibility. Her work also emits a curious sense of compassion and empathy, through a series of gentle visual whispers. A paradoxically warm uncanniness. ‘Home’ is an apposite exhibition in our shifting times of economic and political migration, with Harries-Wood creating an evocative emotional exposition of a home as a thing we all crave, but cannot, for reasons sometimes cruelly beyond our control necessarily get hold of.